Sponsorships are the most important part of our project. 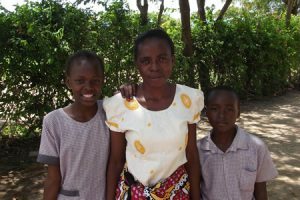 Through sponsorships, the children of very poor families obtain an opportunity for good education and thus a better life. About half of the approx. 1,500 children at Mekaela Academies are currently enjoying a scholarship or a sponsorship through Watoto or other charities. Due to that circumstance, we managed to integrate Mekaela Academies into society, rather than just creating elite schools for better-off families. This is how children may obtain a sponsorship: The parents submit an application form, on which they agree to the terms and conditions of sponsorship. After the school’s management has approved it the form is sent to Germany where Watoto places the child on the waiting list until we find a sponsor for them. It is easy to become a sponsor: Just click on the button “Sponsor a Child” and send your declaration to us directly. If you which to have a downloadable form which you can print, email or fax, please click here. We prefer to collect sponsorships fees by direct debit, but payments by standing order are also possible. Watoto e.V. issues a tax certificate for your donation. As our administrative and advertising costs are covered specifically by designated donations from our members, all donations are forwarded to the schools and the children with no deductions. At the beginning of each term, Watoto transfers due amounts for school fees to Kenya. During the year, we receive copies of the children’s report books as well as their letters to the sponsors and pictures which we forward to the sponsors. To keep our administration lean and free of charge, we generally send these documents as well as tax receipts once at the end of the year. Nevertheless every sponsor may always inquire with Watoto about the status of his protégé. If a child’s performance drops below the level of 50% in three consecutive terms, the sponsorship may be withdrawn. There are good reasons for this: A significant drop in the performance usually indicates that the family has lost interest in the education of their child, thus reducing the likelihood that the child will finish primary school level or even secondary, let alone join university.On the other hand, dozens of families are desperately waiting for sponsorship for their child, and they are perfectly willing to work hard for such an opportunity. For their sake, it just wouldn’t be fair to block the way into a better future. We do not think a sponsorship should relieve parents of all financial burden. Some sort of contribution should be paid by parents, too, no matter how small it might be. As a rule, we expect parents of sponsored children to pay for exam and activity fees which amount to less than 5 Euros a month. And one other important suggestion: Every donor should be aware that with the beginning of a sponsorship the child’s and its parents’ hopes are raised by the prospects of a better life through good education. Although Watoto has set up an emergency fund to cater for cases of hardship, every donor carries a large responsibility for the sponsored child. 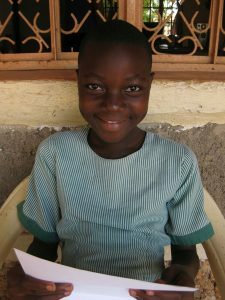 Thus, a sponsorship should only be undertaken with the clear intention of following it through to the end of the child’s education, even for several years. * We are assuming a EURO exchange rate of KES 105/= on from January 2018. The conversion from official fees in KES to EUR does not always exactly match. The assumed rate provides a safety margin against the volatility of the Kenya Shilling. Any windfall profits Watoto e.V. might obtain from better exchange rates will be allocated to the emergency fund (e.g. for terminated sponsorships). 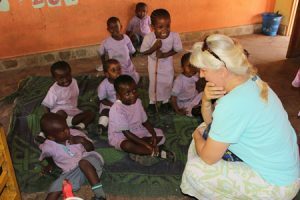 Micki Wentzel is in charge for sponsorships at Watoto. She maintains communication between the donors, the schools and Watoto. Any inquiries may be directed to Micki (click here), so if you wish to obtain further information about a possible sponsorship, please contact her by email. Many people who know our project would like to offer sustained help, but find it difficult to meet the conditions of a full sponsorship. We developed the “Hamsini” programme to enable people to support our children in Kenya with a good conscience and without obligation. Only 50 Euros per year to provide sustained support for a child. That is where the name of the programme was derived from – Hamsini means “fifty” in Kisuaheli. The donations of several sponsors are cumulated to help financing a full scholarship for a child at Mekaela Academies. The exact amount which is required to pay for a full scholarship depends on several factors, i.e. the neediness of the family or the school-class of a pupil. The annual cost vary between 300 Euros for a day school in the primary section to 1000 Euros for secondary school boarding. Although sponsors of Hamsini may not decide which child will receive a scholarship and to what extent, they still know which child is being supported with their contribution, and they may keep themselves informed about the child on the internet. For that purpose we provide a password protected area on our server where we keep historical information about the child such as photos, school reports, letters and all other meaningful and current information which might be of interest for the child’s sponsors. Hamsini offers the option of setting a fixed expiration date when the support will end automatically. You may of course join the Hamsini programme without fixing an expiration date in advance, and naturally your support may exceed the amount of 50 Euros, too. You may cancel your support at any time without providing a specific reason. Watoto e.V. will not be able to provide personal information directly or other customer services to the sponsors of the Hamsini programme. Just 9 Euros a month can enable low income families to send their children to our schools. Since 2013, Kenya has recorded declining tourist numbers. Kenyans are paying a high price for the country’s engagement against terrorism in Somalia, which helped eradicating piracy off the Somali coast – plus some other bad things. Currently, hotels’ occupancy is well below 50% and they have responded with layoffs. As there is no social welfare network in Kenya, the layoffs immediately affect the lives of the people. Other industries feel the impact as well, because the people have less disposable income. The chain reaction has finally reached Mekaela Academies. Within a year, we have lost more than 200 students because parents can no longer afford to pay school fees. Due to this decline, the schools currently incur losses. That is not sustainable, but we also don’t simply want to lay people off, because downsizing often does more harm than good, and there seems to be a silver lining on the horizon for the tourism industry which may improve in the no too distant future. We believe we have found a better way and launched a programme named “999”. The objective is to enable families with low income to send their children to our schools for just 999 Shillings (approx. 9 Euros) a month. The name emphasises the urgency of this programme because “999” is also the Kenyan emergency telephone number. Naturally, the difference between 999 Shillings and the actual costs will have to come from somewhere. Firstly, Mekaela Academies staff have agreed to contribute to the 999 Programme by forfeiting between 10% and 30% (management) of their net salaries. For humanitarian reasons we have excluded members of staff with salaries of less than 125 Euros per month from those cuts. Secondly, Watoto e.V. will allocate all free donations to the 999 Programme from now on. On top of the staff’s contribution, about 150 Euros per year would be required to send one child to our schools in the 999 programme. Our target is to enrol 200 new pupils to Mekaela Academies, thus around 30,000 Euros per year would be needed to fund the programme. If we achieve that, the schools will be out of the woods.